The Month of December is very significant as several religious events occur in this month. According to Buddhist history,introduction of Bhikkuni Sasanaya (the Order of Nuns) took place on Uduwap Full moon Poya day which is commemorated in December.After Arahat Mahinda introduced Buddhism officially to Sri Lanka the lives of the Sri Lankan people were dramatically changed. It gave a definite way of life with philosophon life. According to a request made by the King Devanampiyatissa’s sister-in-law Queen Anula to enter the Bhikkuni Sasana King Devanampiyatissa sought the help of Emperor Asoka. On the request emperor Asoka helped Sri Lanka by dispatching Theri Sanghamitta to Sri Lanka. The sacred Bo-sapling was brought with her coming to Sri Lanka. The Bo-sapling which was from Sri Maha Bodhi at Bodh Gaya was planted in Mahamevna gardens at Anuradhapura amidst much ceremony. The sacred Bo tree is not just a tree. The word “BO” is terminology, derived from the Pali word “BODHI” signifying holiness, and because, it was under a BO-Tree that Gauthama Buddha attained the Supreme Enlightenment. The Bo-Tree (FICUS RELIGIOSA) belongs to the genus fig of the Botanical family Moraceae. The religious and cultural value of bringing Bo sapling is the evolution of the customary tradition centering the Bo tree worship. Later it became customary for every vihara to have a Bodhiya. It is considered as a duty of Bhikku to preserve and look after the bodhiya with tender care. Planting Sri maha Bo sapling also symbolize the Buddhism was firmly established in Sri Lanka. People from all over the world despite religious differences pay their homage and respect to the Jaya Sri Maha Bodhi in Anuradhapura. It is this very tree that is venerated by Buddhists in world over. It is also the oldest documented tree in the world. Sanghamitta Theri established the Bhikkhuni Sasana in Sri Lanka. Lord Buddha allowed women to enter the Buddha sasana. Women’s entering to the Buddha Sasana was definitely a remarkable fact as it was a time which had not given several privileges to women. With the arrival of Theri Sangamiththa Queen Anula and her retinue of 500 ladies entered Bhikkuni Sasana which helped the womenfolk of Sri Lanka. One of the main reasons for Buddhism to spread fast in Sri Lanka was the royal patronage. There was a distinctive change in the social and religious life of the country, also in the economic sphere. These bhikkunis of the Theri Sangamitta’s generation very silently contributed their share in promoting the Message of Buddha. The part played by women in the spread of Buddhism cannot be brushed aside as of little importance. With them Sri Lankan culture also took on upward turn. 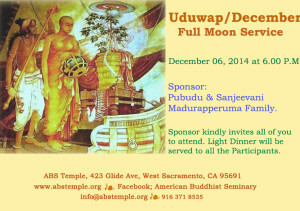 This Poya Puja is Sponsored by Pubudu & Sanjeewani Madurapperuma Family.